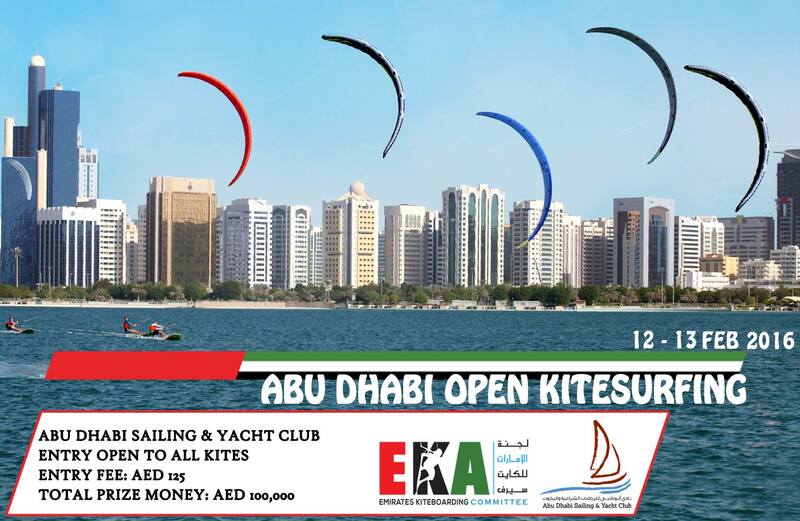 Abu Dhabi Sailing & yacht club Organizing “Abu Dhabi Open Kitesurfing 2016” from 12th – 13th February, 2016 near the breakwater, ABUDHABI Corniche & technical operations are conducted by Emirates Kitesurfing Committee. Please note that Registration scheduled from 10 Jan - 11 feb 2016. Completed registration forms must be checked in before 10:00 am on February 12th at the Race Office located on the beach. Riders under age of 18 must have written permission of parents or lawful minders to compete in Kite Event. The maximum number of entries for the event shall be 60 persons. Technical Competency considering on (height & power). 13:00 – 18:00 Race, Freestyle. 11:00 – 12:00 Competitors meeting. 12:00 – 16:00 Race, Freestyle. Competitors are requested to keep and launch their kites only from the launching area located on the beach during the competitions. Keep this area clear of any object other than kiteboard equipment. Completely clear the shore of this area from any equipment (approximately 5 meters from the sea) that will be considered as a safety area. Only competitors competing during his/her qualifying heat are requested to kite on the competitions area. This Notice of Competition and Kiteboarding Instructions.